Not bad if you just want out of the box FM sounds, but DX7 lovers will be disappointed. Sounds good, and instantly familiar. Primitive sound editing. Lacks versatility. Yamaha's interpretation of Frequency Modulation synthesis needs no introduction. It's a sound splattered across many '80s synth classics, and recreated by various soft synths. 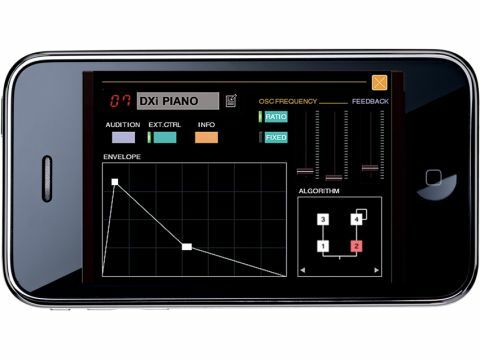 DXi brings FM to your phone, but it's closer to the DX27 than the legendary DX7. There are four operators rather than six and polyphony is reduced from 16 to three, from what we can tell. DXi also offers a neat 16-step sequencer and an effective XY performance pad, to mix operators and patterns in real time. Sound editing is primitive. You can flick between eight algorithms and edit a four-stage amplitude envelope for each operator, but you can't listen to frequency and feedback changes as you make them - you need to press Audition again for these to be heard. While DXi does sound good, and you can recreate many classic sounds, it lacks versatility for the experimentalists, and completeness for the purists, sort of defeating the point of it being a synth and not a ROMpler.